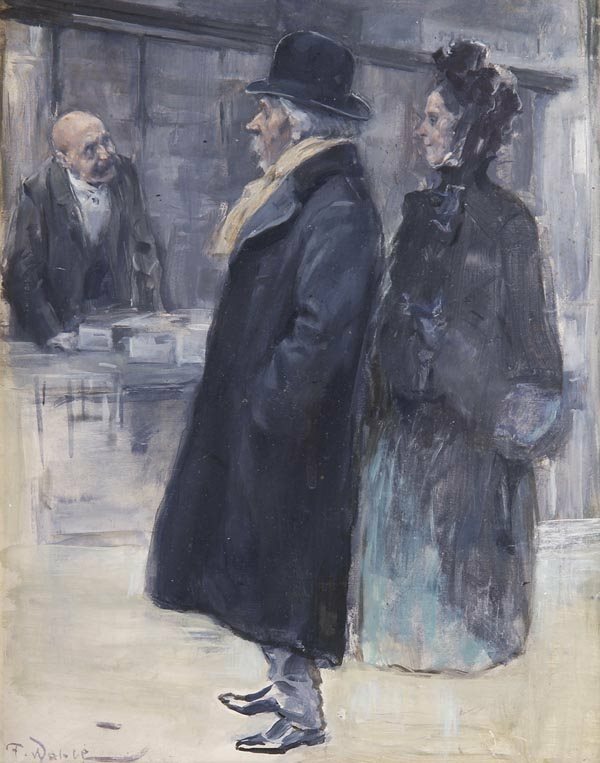 The painting above, “Beim Einkauf (When Shopping)” was sold by Von Zezschwitz Art and Design Auctions in Munich in 2005. They estimated the painting to dated to 1895. 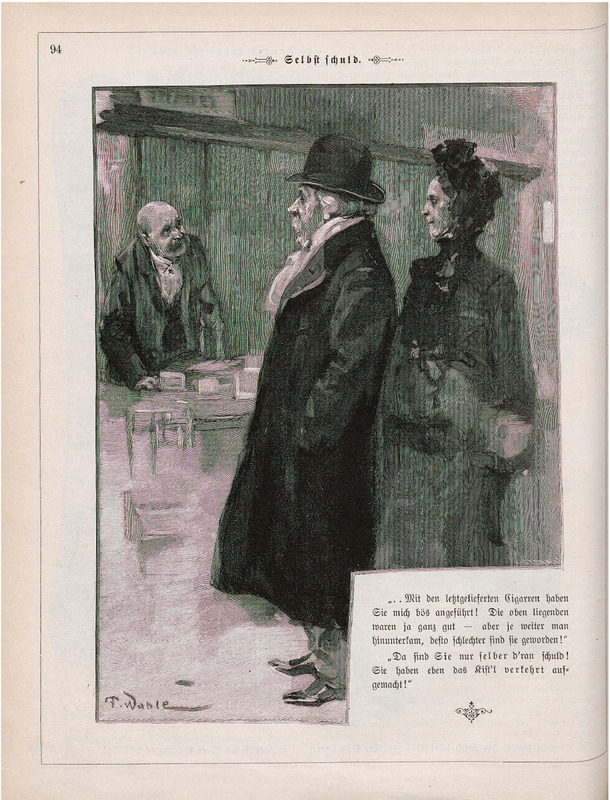 Turns out it is actually from mid-February 1900 in Fliegende Blatter! The image takes up an entire page which is typical for Wahle’ works. The unfinished bottom right corner in the painting corresponds to a cut-out for a block of text in the journal version. I am having a really hard time even interpreting the Gothic-style typography used for Fliegende Blatter (for examples “s” and “f” look alike) and so I don’t have a good translation of the story. But there you have it, the first auction to magazine match! As it so happened, I had won tickets to attend Antiques Roadshow in Boston the weekend after I returned from Turkey. We had a poster to appraise (hurray, it is real!) and so I took the opportunity to ask the appraiser how the art in Fliegende Blatter would have been produced at the turn of the century. He confirmed by suspicions that there wasn’t any technology available to reproduce images and so the Wahle painting was copied by an engraver for publication. Looking closely at the print version of “When Shopping”, I found the tiny signature of the engraver in the bottom right corner above the text block. 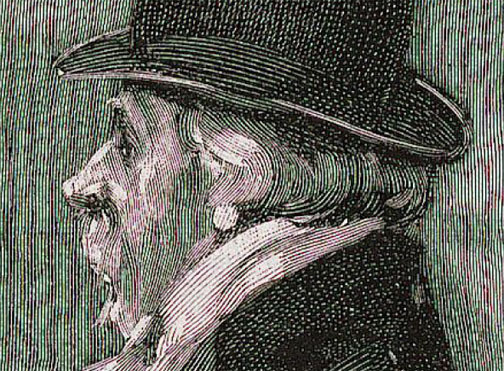 The Engraver – this is another aspect of 19th century print art that I hadn’t considered. While Wahle and the other Fliegende Blatter painters composed the images and expertly executed them, there was a whole set of artists that quite skillfully copied them. I have been impressed with the clear translation of painted brushstrokes in the printed reproductions of Wahle’s paintings. While at the time this may have been considered more of a craftsman’s work, I have to think that the engravers were as skilled as the painters themselves. This gives to another avenue to pursue although I worry that any information about the engraver may be quite slim. Hi, my name is hanna and i just happened to find your web page on Friedrich Wahle. My grandfather used to work at the Fliegende Blaetter and for this reason we have several sketches of this great artist. I share your enthusiasm for this kind of art. Welcome Hanna! Thanks for commenting. I’m glad to hear you enjoy this work as well! It’s very exciting to hear that you have some of these sketches! Can you use the “Contact Me” page to send me more information about the sketches you have? I’m creating a catalog of F. Wahle’s work so I should be able to tell you if these were published pieces!